While resigning ourselves to the inevitability that few moments during this Sunday's 90th Annual Academy Awards will come close to matching the shocking final minutes of last year's show, I have only wish for the 2018 Oscars: That they keep it about the movies. We've had about four to six months of #MeToo, #TimesUp and Harvey Weinstein so I don't think it's asking too much, aside from the opening monologue, for the industry to spend one night focusing all their attention on celebrating and appreciating the onscreen work we've seen in the past year. That is, after all, why the Oscars exist. And boy do we badly need that celebration now, with the gap between the tastes of the general moviegoing public and the Academy of Motion Picture Arts and Sciences growing by the day. With the notable exception of box office juggernaut Get Out, there's really no 2017 film listed here that came close to permeating the culture or causing even casual chatter among the general population. And there's still the chance that may not even go home with anything. Movies just aren't at the forefront right now, but that's okay since there's still no better night all year for those who love good ones. That one of the best Oscar hosts in years, Jimmy Kimmel earned the call back can only be viewed as a positive, as is the recent news that Warren Beatty and Faye Dunaway will be returning to the scene of the crime, attempting again to present Best Picture after last year's ridiculously entertaining debacle. Speaking of which, this might be the most wide open Best Picture category we've ever had, with as many as three films or four films all with a solid chance of taking home the gold. Unfortunately for me, it could also mean owning the embarrassment of incorrectly predicting the biggest category for the third consecutive year. So, as I struggle to play catch up again and cram in viewings of all these nominees, here's hoping they build on last year's momentum to deliver another solid, well produced broadcast that doesn't run over 5 hours long. Below are my predictions, along with some comments on the major categories. As usual, I'm reserving the right to adjust these picks leading up to the start of the show. This is where they honor Call Me by Your Name. There's no other place to do it and the rest of the nominees in this field aren't strong enough competition. The Disaster Artist's temporary momentum was thwarted by the Franco scandal, Molly's Game was met with mixed to tepid reactions, most are still more enamored with Mudbound's cinematography than its script and Logan becomes the first superhero film to score a screenplay nod, which will be reward enough in the minds of voters. Further tipping the scales in James Ivory's favor is the fact that the legendary Merchant Ivory co-founder is almost 90 years old and awarding him here for decades of top shelf work as a director, writer and producer allows the Academy to give him a more meaningful Oscar than the honorary one he would have surely received otherwise. *The second closest race of the night and a potentially major clue as to the eventual Best Picture winner later that night. Or maybe not. The Big Sick stands no chance, sticking out like a sore thumb among these heavy hitters. Any of the remaining four can win, but it stands to reason that Get Out and Three Billboards are the frontrunners since most admired The Shape of Water for reasons more related to its acting and directing than screenplay. Still, it's a serious threat just on the sheer number of nominations and respect voters have for del Toro. There's a legitimate possibility Lady Bird could leave empty handed so this might be their only chance to reward Gerwig, with the added benefit of a woman winning a writing reward, which rarely happens. It's hard to imagine the Academy not wanting to give this to McDonagh since he missed a Director nomination and wrote a hell of a part for McDormand. But if anything can beat it, it's Peele's script for Get Out. This one's a tough call. *Most were surprised, but delighted, that both Lesley Manville and Mary J. Blige made the cut, and the same can be said for Octavia Spencer. But this all comes down to Allison Janey vs. Laurie Metcalf in a battle between two talented, highly respected TV and stage actresses whose careers have followed a somewhat similar trajectory. Metcalf's in the more warmly received film and got better reviews for her performance in Lady Bird, a turn most believe is underrated, even at this late stage. For a while, it really did seem like she would take this, but now it's looking more like a great breakthrough that will undoubtedly keep her on the big screen radar for the foreseeable future. Janney's simply more popular among voters and has the type of scenery chomping, monster villain role the Academy tends to gravitate toward. In their minds, more acting means better acting, which should lead to a reasonably predictable win for the long overdue actress and I, Tonya's only Oscar of the night. *Plummer's nomination feels entirely like a further indictment of Kevin Spacey and respect for the acting legend stepping into that role at such short notice. No one's talked about the actual performance more than any of the film's scandals, and that Plummer recently won in this category won't help him. Jenkins may have been great in The Shape of Water, but he's hardly the first or second thing mentioned when people talk about the picture, with many even assuming Michael Shannon would get his slot. Harrelson's chances diminish next to flashier Three Billboards co-star and likely winner Sam Rockwell, giving voters an opportunity to finally reward one of our most prolific, underappreciated actors for a highly controversial, but well respected performance. His closest competition was Willem Dafoe, but The Florida Project has really stalled, to the point that few are even still discussing him as a serious threat to upset anymore. *Saoirse Ronan seemingly had all the momentum going for Lady Bird, so you have to wonder what happened. Is the movie too slight for voters? After honoring Brie Larson and Emma Stone in this category in consecutive years, is the Academy suddenly tired of honoring the young ingenue? Is McDormand just too respected within the industry? It could be any combination of these, including the possibility they just simply like her performance as a grieving mother out for justice in Three Billboards better. All of this will be enough, and she'll win her second Oscar. While Ronan's still the most serious threat to that, Hawkins isn't far behind. Streep's nomination feels more deserved than gifted this time around, but she won't win since The Post fizzled. The outlier is Margot Robbie for her transformative, career-altering turn as Tonya Harding, but she probably has a better shot at actually landing a triple axel than taking home the gold in a field this strong. *Washington, deserving as he may be, is only here because James Franco isn't. It would take an incredible surge of Get Out goodwill to carry Kaluuya to the win. Call Me by your Name has lost a lot of steam heading into the final stretch, and for Chalamet, the nomination will have to be enough, kickstarting a promising career, but depriving him the honor of becoming the youngest Best Actor winner in history. Day-Lewis is always a threat, but his recent retirement announcement makes him more so in a field that's actually kind of weak. Gary Oldman is clearly the lock of the night for his immersive disappearing act as Winston Churchill in Darkest Hour, offering voters the opportunity to honor the career of a long overdue talent playing a historical figure in the kind of biographic movie they love. It's a foregone conclusion, in what's easily the least interesting, most predictable category of the night. *The combination of Del Toro having the coveted DGA win and the most nominated film should spell victory for the well like and respected Shape of Water director. While an upset in this category is entirely possible, it isn't likely, as the Best Picture field is far murkier and more difficult to call. Picture and Director have been splitting in recent years, so the big question of the evening is whether the del Toro love will be enough to carry his monster movie romance over the considerable hump of genre bias. If he were to lose, the most likely spoilers are Nolan, Peele, or Gerwig. Either of the latter two would send a serious message about the Academy's progressiveness in the wake of industry turmoil. We anticipated Gerwig would one day arrive here, just not in this category, and Peele delivered something few knew he had in him. In these cases, it really does feel as if the nominations alone are victories, and well deserved ones at that. And you know a field is strong when America's greatest living director, Paul Thomas Anderson, has the least chance of winning. That his movies will never be considered "Oscar friendly" might be the highest compliment paid to him. *Get Out doesn't have an editing nomination, Three Billboards doesn't have a Director nomination and The Shape of Water, despite its 13 nomination haul, doesn't have that coveted SAG Ensemble nod (the devastating statistic that took down La La Land last year). Dunkirk and Lady Bird are still in this, even as the former suffers from a lack of acting nods and the fact that the days of a war movie automatically winning Best Picture are long gone, as the Academy's makeup has changed considerably over the past few years. Despite widespread love for it, Lady Bird just won't have the heft and substance to go all the way in the minds of voters. The Post, Darkest Hour and Call Me by Your Name are the three with virtually no chance, their campaigns peaking months ago as they limp to the finish line for the closest Best Picture race we've had in at least a decade. Get Out can win with this preferential balloting system because those who love it, really, really love it and will put it down as their number one. If it does win, that's why. Plus, how many movies are still being talked about well over a full year after their release?! Still, it's horror, and while the Academy's evolved, that's just a bridge too far for them. 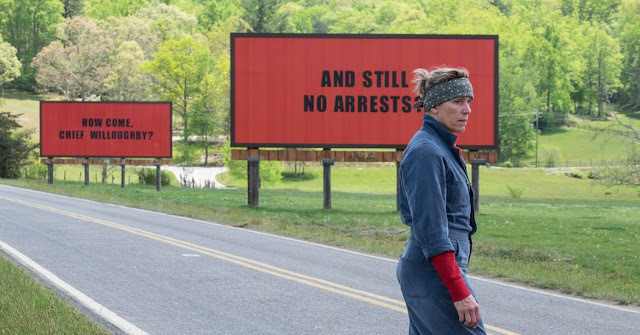 Three Billboards overcame a fair amount of backlash and controversy to become even stronger and timelier than it was upon its initial release. And similarly, those who love it, really love it, shooting it to the top of many ballots. But it's polarizing, and I just can't get past the fact it doesn't have that directing nomination. Argo may have overcome that lack of a directing nod, but Three Billboards doesn't have the Affleck factor at play. It's a lot more difficult to digest and we know the winner needs to be universally beloved. That's why if I go down again in this category, I'll do it being safe and statistically sound by picking The Shape of Water. I'm going against the grain somewhat by anticipating an unexpected match with Picture and Director, but 13 nominations is just too much, especially since the Academy's proven they'll occasionally go for fantasy, if warranted. This should be one of those rare cases, as del Toro's film seems to have the least going against it. Sometimes, that's what matters most.